Easy and very long lived. Staking is not needed despite height. Excellent cut flower. One of my favorite natives. 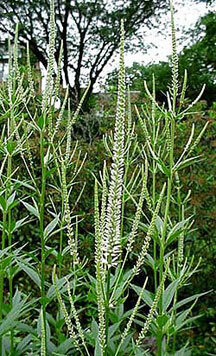 Culver's Root is a beautiful native species that is typically found in moist meadows and along the edges of woods. It is a stately plant prized for its well-defined, clean lines. It reaches 3 to 5 feet and produces elegant white flower stalks in late summer - long after most other white flowers have finished blooming. It is very lovely in the back of the border and planted with other tall natives such New England Asters. The white spikes make nice additions to bouquets. As indicated by its native settings, this is a plant that can tolerate a fairly damp site and light shade. It will perform well in a normal garden setting as long as it is not allowed to dry out during hot, dry periods. It is somewhat slow to develop and will take a couple of years to show its best form. Division is generally not necessary though plants can be divided in the spring as a means of increase. Space new plants about 18 inches apart.